ROAD TESTED mATCHLESS LiGHTNiNG 15 GUiTAR AmP ComBo state practice amp, right? The craftsmanship is flawlessly superb, as is Matchless custom. It’s a very sturdy, heavy, chunky amp, and it means business. AN EN-LIGHTNING ExPERIENCE For testing I brought along my Gibson Les Paul Traditional with low-output Seymour Duncan Seth Lover PAF-style humbuckers and my trusty overdrive pedal. Now, when you look at this amp, you might think “Ooh, that’s gotta have some classy clean tones. Maybe I’ll use it for country or maybe some kind of gentle indie kinda thing… well, you, sir/madam, are in for a shock. 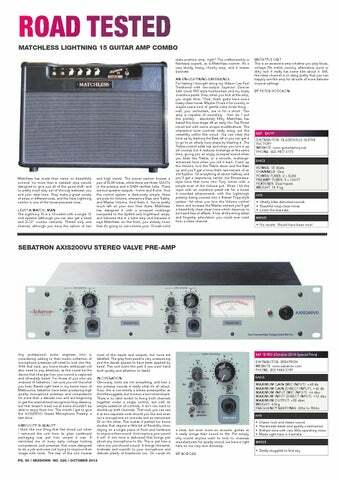 This amp is capable of sounding… how do I put this politely… absolutely filthy. Matchless has based the tone stage off an early Vox Top Boost circuit but with some unique modifications. The interactive tone controls really bring out the versatility within this circuit. You can clear the tone up by backing the Bass off or you can get it to go to an utterly hairy place by blasting it. The Treble control adds top end when you turn it up (of course), but it reduces midrange at the same time, giving you an angry, scooped sound when you blast the Treble, or a smooth, midrangeenhanced tone when you roll it back. Crank up the Volume, turn the Treble down and the Bass up and you’ll get a tone that’s reminiscent of an old fuzzbox. Sit everything at about halfway and you’ll get a responsive, tactile Joe Bonamassastyle tone that turns into Tony Iommi with a simple twist of the Volume pot. When I hit the input with an overdrive pedal set for a boost it sounded phenomenal, with the Lightning’s preamp being coaxed into a Robert Fripp-style sustain. Yet when you turn the Volume control down and increase the Master instead you’ll get a beautifully clear clean tone which deserves to be heard free of effects. It has all the string detail and fingertip articulation you could ever want from a clean channel. • No reverb. Would have been nice! most of the inputs and outputs, but none are labelled. The grey front panel is very unassuming and the decals appear to have been applied by hand. This unit looks the part if you want hand built quality and attention to detail.